– According to California Private Investigator, Paul Kangas, and he is one of the best, FBI documents prove that Jack Ruby had been an employee of Richard Nixon since 1947. Jack Ruby was allegedly listed as working as a spy & hit man for Nixon. On November 22, 1963 Ruby was seen by a women who knew him well, Julian Ann Mercer, approximately an hour before the arrival of JFK’s motorcade, unloading a man carrying a rifle in a case at the Grassy Knoll from his car. Ruby was later seen on national TV killing a witness who could link Nixon and Johnson to the killing of JFK. Richard Nixon was Vice President from 1952 until 1960 and is credited with planning Operation 40, the secret 1961 invasion of Cuba. The glove fits. This FBI-document of 1947 recommends that “one Jack Rubenstein of Chicago” should not be called to testify for the Committee on Unamerican Activities, for he is working for Congressman Richard M. Nixon. According to the Warren Commission, Ruby had no connections with Oswald, Organized Crime or the Government. No wonder the header reads “This is sensitive”. Hoch wondered about Stone’s source. In a comment on Stone’s article, author Jean Davison noted that a “letter from Nixon mentioning a ‘Jack Rubenstein’” has been around for a long time. The document in question is not exactly a letter, nor is it “from Nixon.” Rather, it is sworn statement, dated Nov. 24, 1947, from a staffer (identified only as ‘LS”) who asserts that “Jack Rubenstein of Chicago” was “performing information functions” for Nixon’s staff and should not be called to testify in open hearings by the House Un-American Activities Committee. Long ago, when Hoch was more conspiratorially minded than he is now, he wrote that he thought the letter was a forgery. In 2006 Gary Buell posted a detailed commentary on questions about the document’s authenticity. One key point of dispute is the letterhead on the document that includes a five-digit Zip Code — a system not adopted until 1963. Davison says the 1947 memo refers to the communist Jack Rubenstein, not the Jack Rubenstein who changed his name to Jack Ruby. But the disputed memo refers to “Jack Rubenstein of Chicago,” which is where the Dallas Jack Ruby hailed from. The communist Jack Ruby was from New Jersey and there is no mention of Chicago in his obituary. 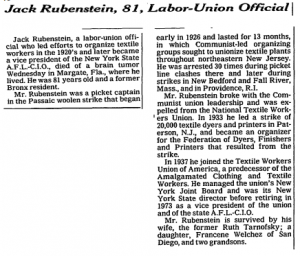 Gary Mack of the Sixth Floor museum endorses Davison’s view — that the document refers to the communist Jack Rubenstein, not the Jack Rubenstein changed his name to Jack Ruby. Mack says a Chicago newspaper reporter debunked the story that Nixon knew Ruby a long time ago. I’ve asked him to provide a copy of the debunking, and he says he will try to track it down. Meanwhile, I asked Stone for comment. Stone also said he has “a direct quote from Nixon who acknowledged in 1989 that his aide Murray Chotiner brought Ruby to him in 1947 and told him LBJ wanted Ruby hired as an informant for the House UnAmerican Activities Committee,” otherwise known as HUAC. At this point I think the preponderance of evidence favors Stone. That is to say, I think the document is a genuine HUAC record from 1947. Per Occam’s Razor, I think that the explanation that the more modern letterhead with the zip code was copied along atop the original document is a simpler, less conspiratorial explanation than forgery. I also think that the note refers to Jack Rubenstein from Chicago who would change his last name to Ruby and who would change history by killing Lee Oswald. 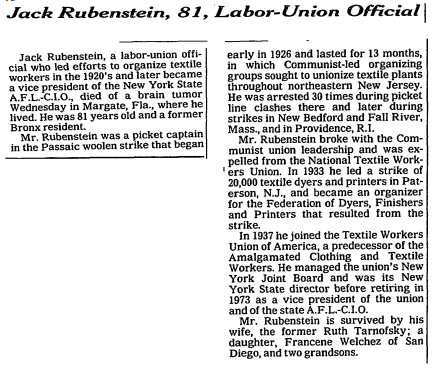 Unless Davison and Mack have some evidence that the communist Jack Rubenstein lived in Chicago in 1947, I doubt he is the person referenced in the note. A more definitive pronouncement would be premature. The possibility of forgery cannot be ruled out until the original document can be located and examined. The newspaper article cited by Mack may also have important information. The significance of the record is yet another issue. After all, so what if Congressman Richard Nixon had a passing acquaintance with Jack Ruby 16 years before the events of November 1963? Even if authentic, the document sheds no light on Stone’s more consequential allegation: that it was Congressman Lyndon Johnson who recommended Ruby to Nixon in 1947. To assess that claim we need to know more about what Murray Chotiner, a close aide to Nixon, said and when he said it.